Interactive Games and Puzzels Tha Make Learning Grammar Fun! Features of "Grammar Made Easy"
"Grammar Made Easy, in a fun game-show format, teaches and tests children's understanding of grammar in a way no textbook can! This program goes beyond simple diagrams and introduces parts of speech and sentence structure in innovative and captivating lessons. Intelligent software assesses each student's abilities and then presents tutorials for those topics where special attention is needed. The program also includes a Teacher/Parent Section where each student's progress report can be viewed. Working independently with Grammar Made Easy, children will master grammar, a key building block for writing and communicating effectively! How important is grammar for your young students? That's a question that has been discussed quite a bit, by many people. When your child submits a paper in school, bad grammar translates to "lower grades". When your child interacts with their peers, they'll get more respect. Children who use proper grammar will attract more intelligent friends. According to a study by Stephanie Fagnani, published in the small business section of Chron.com, "In today's highly competitive and global business landscape, being able to communicate quickly and effectively gives employees and entire organizations an edge over less articulate competitors. Having good grammar in the workplace can ease employee relations with colleagues and clients and can even be a key factor in a future promotion." Ms Fagnani points out, "Being able to communicate effectively in the workplace is a key time management skill and having a good grasp on proper grammar can help ensure messages are delivered and received promptly." Additionally, "Good grammar affects how others feel about and respond to each other, which carries a lot of importance in the business arena." The article goes on to say proper grammar by employees, "saves money" and "saves jobs". 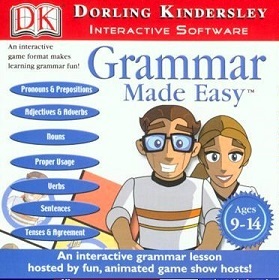 "Grammar Made Easy", by Dorling Kindersley, is a very entertaining way for your student, or for that matter yourself, to learn and practice the grammar skills that will last for a lifetime! In a fun game-show format, Grammar Made Easy teaches and tests children's understanding of grammar in a way no textbook can! This program goes beyond simple diagrams and introduces parts of speech and sentence structure in innovative and captivating lessons.